I am sure I am not the only one who feels this way. Many people I know in the Philippines and in many parts of the world feel a collective letdown at how the world has been running lately. I am talking about the challenges hurled at the values and beliefs humankind holds dear. Things most of us believe in — like human rights, fairness, tolerance, freedom and justice, openness, science, logic, diplomacy, the unifying aspects of religion, the equality of all people and races — are now being questioned. Racism, bigotry, terrorism, intolerance and an utter disbelief in science and logic have built up to an all-time high in the past 30 years. People seem to be fact-resistant, unable to analyze fairly. Nor do they have a wide enough grasp of history to understand what is happening. Many people I have met recently have no clear idea of events that transpired in the world in the past 40 years. These seem to be beyond the limit of their comprehension, too ancient to be analyzed, much less understood or valued. Many easily buy into memes, lies and manipulation created to convince them to rally behind wrong causes. Serious reading of anything beyond a few paragraphs is a dying practice. Ironically, at this moment when technology, the Internet and Google allow us practically unlimited access to knowledge, wisdom and data, more people seem to be ignorant about what has transpired that has shaped our societies and the entire direction of mankind itself. With so little knowledge and even less wisdom, many people have become absolutists, dogmatic and thus easily gullible. I have often wondered why this is so. Perhaps the array of knowledge on the net is too overwhelming, intimidating and complex to be understood or even bothered with. It is way too challenging for people who want things simple. More and more, I see people turning to oversimplified positions that quickly deteriorate into insults, threats and shaming, in place of listening and arguing politely and — yes — rationally. For example, the fight against addiction and drugs in our society through summary killings seems to be accepted by the majority. When the dangers of abuse are brought up, these are airily dismissed and instead the question is posed: “Why are you afraid?” They posit that one should only be fearful if one is a drug addict or supports drug use. And anyway, the rich and privileged would never be affected by the drug menace (unless, of course, their kids happen to become addicts). They take aim at the questioner personally so that no intelligent conversation or investigation of the issue is possible. The Brexit vote happened because many older people in England are afraid of diversity and multiculturalism. They are not comfortable with certain foreigners. Not surprisingly, that may be the only issue many of them knew about the EU when they voted. Then there is ISIS and its cruelties and barbarism, which is a big scourge to mankind, especially to the great majority of Muslims who view Islam as a religion of peace. The world seems to be in serious turmoil. Most people are afraid of the unknown. They are afraid to evolve, to think larger. Many easily believe the rhetoric that blames immigrants for all the problems in their countries. And so their allegiance to the values of tolerance, openness, and even democracy are easily suspended. How did this happen? Who let the dogs out and the riff-raff in? There is no simple answer. I notice, though, that ever since people have had easy access to the Internet, many have felt the power to express their views, but not own the responsibility that goes with the power. There is much hate and ignorance in social media. The world is going mad. There is too much mistrust, too much heat generated but too little light produced, too much negativity and hostility. I worry that the deteriorating discourse in social media may be the new norm and direction. The imperative challenge to every thinking person or for anyone who cares about mankind is to remain sane amid the ignorance, racism, intolerance and viciousness spreading in the world today. Recently, I was with a group of people whom I respect, and after a long talk about the state of our country and the world, we held each other in a tight hug and vowed to stay sane in a world that seems to have stopped thinking and has turned its back on the values that promote equality, human rights, and decency. I cannot help being fearful that the direction of human evolution will be the result of this epic battle between the forces of light and darkness. We must believe that, in the end, the sane will outsmart the negative and ignorant. Each one of us must therefore choose the side of good. This means choosing democracy over dictatorship, education over ignorance, moral values over values that dehumanize us. Mankind paid a lot to overcome the Dark Ages and experience the Age of Enlightenment. It was a huge evolutionary step that made societies kinder and more egalitarian, offering greater opportunities for everyone. Admittedly, more of this has to happen. I trust that a more evolved humanity can make life on this planet better for everyone. In the face of the strong dark forces that fuel the present deterioration in civility, it is my fervent hope that more people commit to being sane and civil. Reason, logic, goodwill, understanding, tolerance, patience and collective action to move higher up the evolutionary ladder are what we need. This is the only way to prevent mankind from going whole-hog crazy. Precious and few are the moments I get to spend time with my kids these days. They are all grown up now, living abroad and have lives of their own. That is why last Thursday night was a special occasion. I had dinner with two of them, Ala and Mio, in Sydney where they now reside. Together with Kaylee, Mio’s girlfriend, we had dinner in Newtown, one of Sydney’s suburbs, at a delightful pizza place. When our kids are young, we parents tend to worry too much. We are often on the lookout for their safety, their health, and their moral and ethical upbringing. We tend to be protective. We are always looking out for them like they are helpless creatures that won’t survive without our guidance. We are in a constant state of vigilance, concern and anticipation of anything that may happen. We are constantly thinking of what is good for them, giving them opportunities, supporting and leading them to the right direction. Often, I find myself contemplating awful scenarios, and if I was asked to give up my arm, or even my life for any of them, I know I would gladly do so without hesitation. But no matter how hard we try, we will never be perfect parents. We will make mistakes. All we can do is give our children all the love we can give. And our kids, even if they are heavily influenced by us, will come into their own in this world And that is how it should be. It was a great feeling to be with Ala and Mio. We talked about a lot of things — their lives, mine, our relatives and friends, what the future will bring. and some what-could-have-beens. We also laughed. All this as we devoured our delicious pizza. I remembered my mom. When I was 27 years old, like Mio is now, she would quietly enjoy watching her kids interacting, smiling with pride in the midst of our conversation. I felt like my mom last night. I sat there watching my kids unfold and express themselves and delighting in how wonderful they are. They had intelligent opinions. They were passionate. They were eloquent. They took pride in their work and their achievements. What I noticed is that they are quite comfortable being who they are. And best of all, they have grown into loving adults. And they get along. After the dinner, we went to a bookstore that was still open. It was a secondhand bookstore that had an interesting collection of books, CDs and old vinyl records. I was amazed to know that Ala has read a lot of the classics as she pointed them out while we examined the shelves. As I watched Ala and Mio go through shelf upon shelf of old and new books, I was beaming with joy and pride at my son and daughter. I was also happy to see that they are readers, a rarity now among millennials who like very short reads that are mostly summarized, having neither the time nor patience for real reading. Ala and Mio, and even Erica, who is in Paris, all like books. As I looked at them, all I felt was gratitude and pride. I felt a deep sense of family bonding, even if my wife Lydia and Erica were not with us. To this father, seeing that they have gone a long way in creating their own lives that in turn nurture them and the people they love is a great achievement. I affirmed to myself that Lydia and I had raised them quite well. The sleepless nights, the hard, tedious daily work of raising them were all worth it. The hours spent reading to them, teaching them their ABCs and 123s and engaging them on many levels, the times when we had to dispense tough love for their own good — these things have all paid off. I leaned back in the car. Mio had his music on. We sang along with his girlfriend all the way home. What a great Dad Moment. Most people are afraid to be vulnerable. When we think of vulnerability, we imagine being defenseless, without any protection. We fear that we are exposed to trouble or potential harm, that someone or something may hurt or destroy us. To be vulnerable is to be at the mercy of outside forces. Anything can happen and it can leave us hurt, powerless, destroyed. To be vulnerable is to have no security, no assurances of being safe or well, to be subject to uncertainty and risk. We are born vulnerable. A newborn baby is extremely fragile. Even if we are born healthy, we can die in a day or two if we do not get the necessary sustenance, or if we are left exposed to the elements. An infant is totally dependent on other humans to survive and to thrive. It is completely helpless. And yet, helplessness is a kind of power as well. When a baby cries, doesn’t a parent drop everything to check on what’s wrong? It makes people around the baby act, show concern and fix whatever is the matter. All of life is vulnerable to something. There is a physical law called entropy that threatens all physical and material things. Everything tends toward decay: everything rusts, rots and eventually gives way to destruction. If we do not actively prevent things from crumbling, they surely will. It is nature’s way. One might say that vulnerability is part of the human condition. While we fear it and go out of our way to protect ourselves, our loved ones and the things we own, we really do not have ironclad protection. Life will always hurt us, somehow. And in the end we will all die. But what if, instead of hiding or worrying about our vulnerability, we embrace and accept it? What would happen? Will we get hurt? We could, or maybe we won’t. Anything is possible. But to relax and let down our emotional, psychological and physical defenses, to let go of certainty and just open ourselves to life, can be liberating. When we do, we allow the world to change and shape us. We open ourselves to new experiences like love, learning and change. We open ourselves to creating and being re-created. This is so true. In a world that controls people with exaggerated fears of danger and failure, it is awesome to see people who defy these dictates and succeed in what they set out to do. You can’t get anything done without exposing yourself to some risk. How can you start a business without risking anything? How can you love someone without the risk of pain and loss? How can you grow and mature without leaving your comfort zone of truths and beliefs that may no longer work for you, and embrace new ones? Everyone who has lived has gone through pain, error and loss. They have also learned a lot about authenticity and being true to oneself. “Real dishes break. That’s how you know they’re real,” wrote the late Marty Rubin, a gay activist and writer from South Florida. To be vulnerable is to live life in a magnified manner. Joys and hurts are felt deeply. But all of living is more intensely experienced. Sometimes, it is better to be sorry than safe. Even when you are hurt there is something to be learned. The more vulnerable you are, the stronger you become. As you begin to awaken to your inner strength, you realize that your true identity lies beyond your physical appearance, ego and feelings. Your essence is divine. Only the ego gets hurt. Your authentic self is invincible. So drop the heavy armor. Feel the wind on your body, allow your being to come alive and declare yourself to the world. To be vulnerable is to be free — and alive. I woke up at 5:15 on Thursday morning, took a shower and put on a Barong, white undershirt and black slacks, up and ready for the inauguration of the 14 th Vice President of the Republic of the Philippines. I was to go first to 36 Valencia Street in New Manila where shuttle buses would bring guests to the VP’s office located at the former Boracay mansion. I felt honored to have been on the guest list for this occasion. I was one of the early birds who got to Valencia practically an hour before the buses left to take guests to the venue. I was too excited. I wanted to see friends whom I worked with to convince Leni, the reluctant candidate, to run for Vice President of the Filipino people, and campaign for her. disinterest. When more people at the party pursued the question, she gave us a look that said her life was fine the way it was. She was a congresswoman who served district well, and a widow who was taking care of her three daughters and she wanted nothing more. She doubted that anyone would even vote for her. Then she turned to us and asked if we were really her friends. The rest of what happened is, of course, history. I got to the venue, sat with friends and since we were early, we looked around the mansion that now houses Leni’s office and took a few pictures there before the ceremony was to start. I also got to chat with outgoing cabinet members about their stint in government. 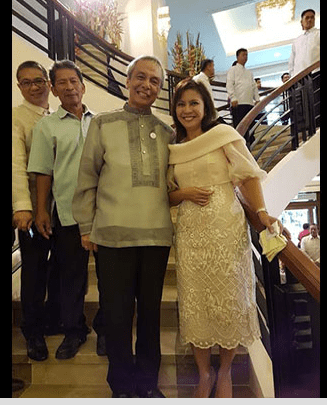 The VP’s arrival was announced, and every one of the more than 600 guests stood up to welcome Leni Robredo, radiant in a re-cycled, re-styled dress she once wore as a wedding sponsor. We cheered as she entered the huge tent where the ceremony was held. A children’s choir sang the National Anthem followed by invocations by four religious leaders (Christian, Muslim, a holy man from the Cordillera, and a Franciscan nun). Then, Leni went up the stage to be sworn in by her chosen barangay captains. She raised her right hand and solemnly swore in Pilipino that she would follow the Constitution and carry out her duties as best she can. individually, posing for selfies, and hugging and throwing kisses athose who were beyond reach if a handshake. Meanwhile, snacks were served inside the Vice President’s official home. When she finally came in, she tirelessly and gamely posed for even more photos. After Noel Cabangon and I had our turn having our pictures taken with the VP, we rushed to Times Street where we joined the neighborhood association and two priests welcome Citizen Noynoy Aquino back to his old neighborhood. After singing a few songs, we ended up having lunch at the Aquino residence where we saw Pnoy, members of his cabinet and friends, watching the last few minutes of incoming President Duterte 's inaugural speech. The room was silent. Then Pnoy called everyone to eat.The mood was light. There seemed to be a feeling of relief. The president was in a joking mood, relaxed and smiling, lying on a butaca. It was quite a sight seeing him, and his cabinet laughing along. I left Times Street at about 2 pm and tried calling for an Uber car. The signal was bad. 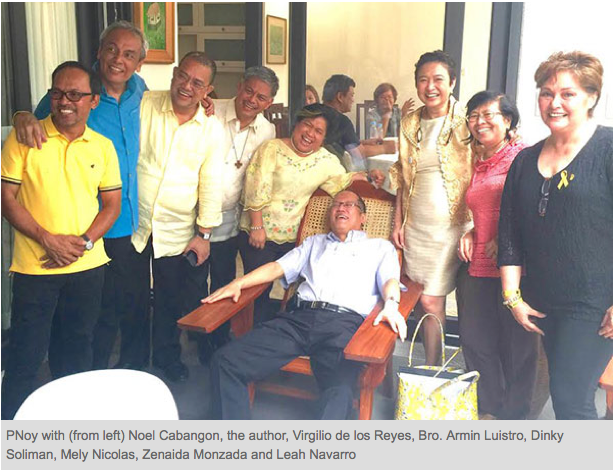 Luckily, former DAR Secretary Gil de los Reyes offered me a ride home, saying he was free and had nnothing better to do. We talked about his boss Noynoy for whom had the highest praises, and the often tireless and thankless job of working in government. He felt he made a difference. He served the people to the best of his ability and he was happy to be going back to private life. concert going on with some of the best Filipino performers giving their all. which pervaded social media during the elections. She acknowledged the hurt of those who fought and defended their candidates. She asked us to let go of all the negativity. The pain,bitterness, suffering, hate will soon go away, she said, and what will remain is the good. Her message was simple but profound, a healing call for unity and cooperation that brought a lot of people to tears, including myself. apologized that she made us cry, but she added, there was just too much hate last elections that has to dissipate. My sisters and I went home aglow from the experience of Leni and her message of peace. Finally on my bed, I felt exhaustion overcome me but, it was a satisfying kind of tiredness. I had done my share supporting Leni and witnessed her inauguration that sealed the whole deal. With a small sense of fulfillment, I said a short prayer of thanks and whispered ‘Mabuhay ang Pilipinas’ in my mind before I drifted to a deep satisfied sleep.